When you hit the streets, you want to go out in style, with a sense of fashion that will have people looking over their shoulders as you walk by. It's that kind of impression that you can make with a brand new pair of Killer Loop sunglasses. Redefine your passion and do what feels right, because that's what living is all about. 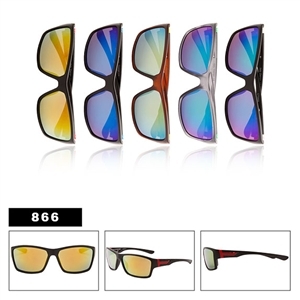 You can't live within boundaries, and now you can break free of the shackles that bind you and break through the clouds; breathe in the fresh air and buy discount wholesale sunglasses. You'll never look back. Sunglasses have a unique power; they can make or break any outfit in a matter of seconds. Without the right pair of sunglasses, you might as well be wearing a trash liner and a leotard. Killer Loop sunglasses are a re-imagining of what style is all about. When you step into the warm sunlight for the first time in your newly delivered pair of Killer Loops, you'll know two things. First, you'll know without a doubt that your eyes are completely protected from the harmful influence of UV light. Second, you'll know that you're holding the world in the palm of your hand. With the right pair of discount wholesale sunglasses, anything is possible. After all, who thought such amazing style and quality could be had for such a low price? These sunglasses are changing the way we view the world. Discount wholesale sunglasses can give you the best deals on any pair of sunglasses that suits you. No matter what your style is, whether it's the sleek retro-modern look of inspired by Killer Loop, the classic style of aviators, or the new extreme look of Xsportz, you will never have trouble finding what's right. Wholesale inspired by Killer Loop sunglasses are available now at a mindbogglingly low price. Once you see how amazing the quality is, you'll wish you had bought more. Don't make that mistake, because it's so easy to purchase them in bulk that it doesn't make sense to do it any other way. When you purchase in bulk, you can get a dozen pairs of sunglasses starting at just $21. You read that right, that's for twelve fully functional pairs of sunglasses. At a price like that, it's easy to see why people are so excited about wholesale designer sunglasses. You get the same amazing quality that you can have with the name brand, but for literally a fraction of the price. That's LESS THAN $2 per pair! The one problem people have with wholesale is that they think it might be slightly lesser quality. This may have been true in the past, but there is a difference when it comes to us. You see, we aren't just the wholesaler of these discount wholesale sunglasses, but the manufacturer as well. We are there for every step of the process, watching over the sunglasses until they are fully made and ready to be shipped straight to your front door. Order a few pairs of inspired by Killer Loop sunglasses today and really see the difference they can make in your life. Please keep in mind that our sunglasses are not fakes or copies of originals. They do not have the brand names or logos on them. They are merely inspired by or compared to that of the original. Not finished shopping yet look at the inspired by Liz Claiborne fashion sunglasses here.